The protection and maintenance of Marlow's beautiful bridge is an ongoing challenge - preventing overweight vehicles, while keeping the bridge an open and practical route for local traffic. This page notes some of the thoughts on how to achieve this and some of the specific events and issues that help illustrate the situation. The closure of the Volvo footbridge across the A404 Marlow By-Pass on 31 Aug to 2 Sep 18 was a programmed event preceded by discussion and coordination between the Highways Agency and Bucks Highways. The Marlow Society Executive was advised by Cllr Collingwood, our Bucks County Councillor that, In view of the debacle on 24 Sep 16 when the Girtewka lorry crossed the Marlow Bridge, Highways England would provide 24 hour protection of our bridge during the closure of the by-pass. As we all know, this was not done and, as a result, 40ft lorries came down the High Street with the intention of crossing the bridge. Executive Committee members have discussed the issue at several recent committee meetings. It is agreed that the Society has a major role, not least as a 'ginger group'. A summary of the thinking so far is collected here. 2. Keep fatigue wear due to repeat loading on the bridge to levels that can be economically dealt with by routine maintenance so that the bridge can continue to serve us without a major rebuild for at least 50 years. No single 'magic fix' seems to exist - an effective solution will be a patchwork of measures. Implementation timescales vary, particularly because some of the proposals need feasibility assessment - it looks like we need a phased approach. Police enforcement. This is being done, although with turning back rather than immediate fines for private vehicles. Officers are unable to provide a 24/7 presence and an intermittent police presence cannot prevent a recurrence of the truck incident. Physical barriers. Bollards are in place. A carefully chosen height restriction would prevent grossly overweight vehicles at all times and could deter larger trade vans. This might be additional to the bollards, or possibly in replacement of them. The exact design and location would be key to not intruding on the beauty of the bridge. Signage. Improve the driver information about the bridge restrictions. Existing warning signs are not optimally placed or kept clear, particularly on the Berkshire side. This would reduce the number of out-of-limit vehicles, reducing bridge wear. Distinct signage is needed at the approaches to the Bisham Roundabout. The introduction of a distinctive 20mph zone on the close approach to Bridge could remind drivers of the sensitive location. CCTV. To be an effective enforcement method requires administrative cooperation between District as operators of the system and TVP and BCC Highways. 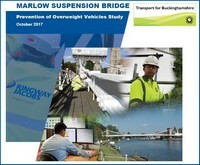 Technically, an extension of Marlow's coverage to the Bridge would appear straightforward. Even without enforcement prosecutions, data from monitoring traffic would give a measure of the effectiveness of other protective measures and even presence of a camera would have deterrent effect. The extent to which the TVP would be able to prosecute using CCTV images as evidence must be determined. In the short-term, the Bridge remains at risk of overload causing structural damage and a physical restriction to prevent grossly large vehicles, even if a temporary method, should be put in place by BCC Highways as soon as possible. TVP are already raising awareness of the existing limit which will reduce wear over time. In the longer term BCC needs to implement proportional protective measures. This requires that for preventative physical barriers, informative signage and monitoring by CCTV, the technicalities must start to be assessed now for consultation between the three parties prior to implementation. A particular issue is whether there could be room for flexibility on the weight limit and whether it could be raised enough to accommodate all reasonable domestic vehicles (SUVs) as owned by people living in Bisham and Cookham Dean. This would facilitate enforcement of any revised wear-control limit. The Society is seeking professional advice on the options and what might be done. The Society looks forward to actively participating in BCC's recently announced public consultation. We will be looking for proposals for permanent overload prevention and wear limitation and for a commitment to implementation of agreed measures in a sensible timescale. Updates on how our Bridge is being protected will be regularly posted on this website.